You’re not here for me… but I’m here for you. Stick Fighting Sport is a resource run by me, Louis Lim, based on my experience of working as a full-time stick fighting instructor since 2010. I teach martial arts enthusiasts and “eskrimadors/arnisadors” combative and sportive stick fighting (ie, Balintawak, Doble Kamay, Sports Anris, etc.) to equip people with the skills they need to defend themselves on the streets. It’s no secret… I use Filipino Martial Arts and other fighting arts to help people become more confident and able to use their skills should the need arise. I want to teach you everything I’ve learned along the way — so you can do the same (minus the pitfalls). Stick Fighting Sport’s goal is to create the most comprehensive and practical reference site for use by martial arts enthusiasts. Here you will find information about the Filipino Martial arts of Eskrima/Arnis/Kali, its history, weaponry, concepts, training, and all those awesome techniques you’ve heard of – single stick, double stick, stick and dagger, sword and stick, locking, take-downs, and the different empty-hand techniques. Stick fighting Sport will cover a volume of subjects related to Filipino Stick Fighting. Thus, it is an indispensable online reference for Martial Arts that you can visit on a regular basis. Though Stick Fighting Sport is completely independent and can be consulted separately for information on Filipino Stick Fighting as a sport, it is expressly designed to be an ultimate resource for Filipino Martial Arts both as a sport and combat art. There are just too many martial arts out there but there aren’t too many superior and practical Martial arts that can give you the ability to defend yourself against possible assailants. Filipino Martial Arts, especially Balintawak Eskrima is one of those highly effective and practical martial arts that are both a combat and sport. The site is intended to help students improve in martial arts. It assembles in an easy-to-learn way the many subjects taught in Filipino Stick Fighting. The most important information on each subject has been distilled and presented in a comprehensive, interesting and easy-to-use way. Our blog posts contain information on techniques, training, schools, history, news, and many other features. In summary, Stick Fighting Sport offers readers and students and those out of school essential information on basic skills (offensive stick fighting, defensive stick fighting, bare hands and a vast collection of easy-to-use data on all major Filipino Martial Arts subjects. There are many more posts to read and courses to take on our site. We are certain that this site will equip you with everything you need to succeed in learning Filipino Martial Arts and to the enjoyment of Stick Fighting. I began my martial arts journey at the age of 8, learning the Japanese martial arts of Karate under my late father Emmanuel Lim, who was a black belt karateka and Master Lino Baban, a 3rd Dan black belt Karateka and national tournament champion. I practiced the famous art of Karate for six years as a member of the Japanese Karate Association (JKA) and won my first provincial tournament silver medal in 1997. I would eventually earn a brown belt and stop formal training when my father and master died in 1998. The warrior spirit developed in me at a very young age and would continue to evolve throughout my life. I was first introduced to the Filipino Stick Fighting Art of Eskrima at the age of 10 – still under the wing of my late father. I learned the popular art of “Modern Arnis,” a Combative and Sportive Filipino Stick Fighting Art founded by the late Grand Master Remi Presas. The art left a lasting impression on me. I was fascinated with its speed, grace, and power. I learned the basic techniques of the art for a short period and fate would reunite me to stick fighting at the perfect time. I was initiated into to the famous martial arts of Taekwondo at the age of 17. I trained for a year at the Main Taekwondo Gym of Cagayan de Oro City, Philippines. I then took another break from martial arts practice, and it would take another six years before I continue my martial arts journey. The year was 2008. I was strolling along one of the city streets one quite evening and heading towards home. It looked just like an ordinary night, and the streets seemed peaceful and quiet. Two guys on a motorcycle approached me, pointed a knife at me and asked for my wallet and cellphone. I had two choices – fight or yield. Missing martial arts training for years, reason told me the odds were against me, and I avoided risking my life for a few cash and a lousy cell phone. The experience, though, would haunt me for a while and put me back on the martial arts path again. Provoked by life and death situation, I retrained in martial arts. I did not want to be robbed and threatened with a knife ever again. In October 2010, I met Guru Andrew P. Obon at the APO-Balintawak Self-Defense Club in Camp Phillips Bukidnon, Philippines and was introduced to the deadly Stick Fighting Art of Balintawak Eskrima. Our involvement in Filipino Martial Arts remains active both offline and online to accomplish its vision and mission. In April and May 2018, Louis underwent a Thirty-Day Intensive Training in Darwa Pangalima Eskrima (DPE), formerly Combative and Sportive Arnis Incorporated (CASASAI), with its founder and Grandmaster Melecio O. Balberde who is also the Vice President of Philippine Eskrima Kali Arnis Federaion Panay (PEKAF Panay). 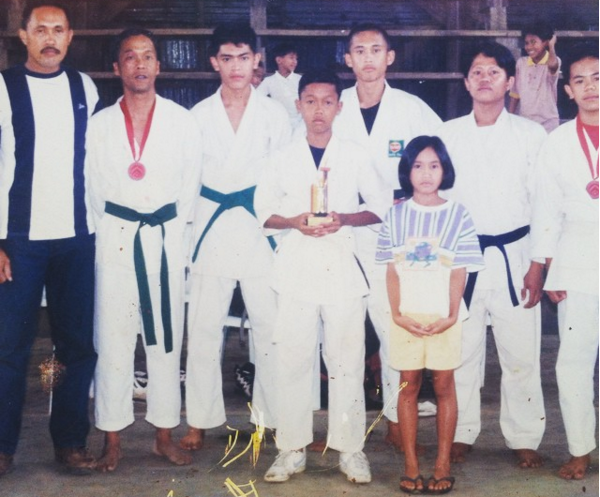 Louis acquired a 2nd Dan Black Belt and became one of instructors of Darwa Pangalima Eskrima Bukidnon Chapter. Photo: Louis training with Darwa Pangalima Eskrima’s Grandmaster Melecio Balberde. Having experienced a life-threating situation in the past, I don’t want other people to experience the same crisis. It is my mission not just to master the Filipino stick fighting art of Balintawak Eskrima but also to teach it to other people. I want to arm people with the skills required to defend themselves on the streets. Balintawak Eskrima is the martial arts I was looking for. It is the martial arts that would equip me and other people with the skills needed to defend ourselves on the streets. I am presently teaching Balintawak Eskrima in his hometown in Damilag Bukidnon and the nearby city of Cagayan de Oro. I see no limits in his evolution as stick fighting instructor and martial artist. It is my goal to spread the art like wildfire, so the world will come to know and learn one of the most effective Filipino Martial Arts to date.